Our second day in Lima, Peru was incredible. We started the morning off at the Camino de Vida facility assembling wheelchairs. Camino de Vida works in partnership with Free Wheelchair Mission. 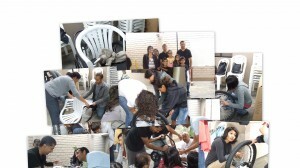 Our team of 24 (the other team worked on this project yesterday) assembled 4 wheelchairs and distributed 6 of them. It’s amazing how durable they are. My group of 8 managed to provide a wheelchair for a 70 year old woman who was paralyzed and immobile, and the second one went to a 3 year old boy whose legs were amputated earlier this year and he continues to be in the hospital due to a lack of diagnosis. 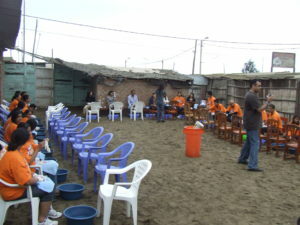 In the afternoon, all 48 of us went to one of the poorest areas of Lima to distribute shoes through Samaritans Feet. What a humbling experience it was to wash the feet of children, women and men, and to provide them with a new pair of shoes while giving them a message of hope. We encouraged them to attend church and have faith in God. Seeing the smiles and excitement in their faces was well worth the long bus ride to get to the distribution site. We all wished we could speak more spanish. It was a long day, but very productive and fulfilling. Stay tuned as we spend the next 3 days taking a break from volunteering to enjoy the sights of Peru. Unfortunately I haven’t been able to load more pictures because of the size restrictions, but hopefully it’s enough to get the idea. We’re having a great time. Can’t wait to see Macchu Picchu tomorrow.